Where first column is the id of series and then x y z. I am drawing models based of these x y z, but I would like to filter them. Draw only 7,14,15 or draw 1 or draw 1,2,3,4,5 etc. What is the best UX for this problem? I though of one textbox and a button. Below there would be numbers listed with thiny x to cancel this filter. 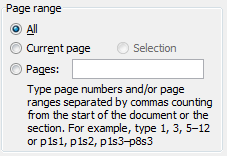 Also, user can input filter seperated with comma (1,2,3). Any better solution for WPF? Two important questions are whether your users are computer-savvy and how many items you're going to have in a list. Here you can combine numbers and ranges in the same textbox (1, 4-11, 21-34), so it's similar to the textbox you suggested. But in this case writing the items out below with the Xs is unnecessary and it complicates things more than it helps - it's usually faster to edit the textbox manually rather than click through the items using the mouse. This is a good UI for people who are comfortable around computers. If your users aren't that advanced, a standard solution is just providing checkboxes next to each item, with select/clear all buttons - but when dealing with large amounts of data, it can become very inconvenient. Given that it's for scientific users a command line type of argument would be best. If they can batch some visualizations and then review them as a whole it would be best. Remember to output the user input for the result in case they want to retry or change parameters. Not the answer you're looking for? Browse other questions tagged filtering wpf or ask your own question. What is the best design for buttons filtering a list? Best UX approach for filtering product categories?